Whispers in the Loggia: Amid Newark Scandal, Pope Ships "Steel" – Bernie Hebda Named Next Jersey Abp. 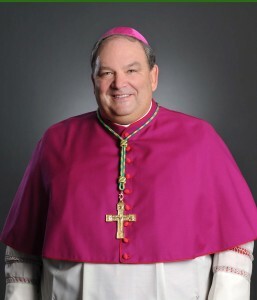 Amid Newark Scandal, Pope Ships "Steel" – Bernie Hebda Named Next Jersey Abp. As only Lou Vallone could sum it up: "It just gets better and better, all the time." At Roman Noon this Tuesday, reacting with lightning speed to a considerable brutta figura in one of the nation's largest dioceses, the Pope made his most consequential Stateside move to date, naming Bishop Bernard Hebda, the 54 year-old head of Michigan's Gaylord diocese, as coadjutor-archbishop of Newark. In New Jersey's 1.4 million-member principal church, the Pittsburgh-born star – a beloved, unassuming cleric, yet one armed with degrees from Harvard and Columbia Law and over a decade's experience in the Vatican's office for legal affairs – will eventually succeed Archbishop John Myers, 72. One of the US church's leading conservatives for a quarter-century and an influential figure on both the national and Roman scenes as chairman of the board of the Pontifical North American College, the Illinois-born metropolitan has been embroiled over recent months in an ongoing, increasingly ugly furore over claims of lacking oversight in cases of priests accused of sexual abuse. While the new coadjutor will likely arrive to begin learning the turf as archbishop-in-waiting within two months, no timetable has yet been indicated for Myers' handover of the reins. It's likewise unknown whether the successor-to-be has been granted any special faculties by the Holy See, which would transfer sole authority over specified elements of the archdiocese's governance to Hebda even while Myers remains in office. In any event, given the most high-profile issue at hand, it is notable that Hebda serves on the USCCB's Committee for the Protection of Children and Young People. The Newark Chancery has called an 11am press conference to introduce the Steeler devotee to the Giants and Jets faithful. At top, Hebda is shown being looked to by Francis during a May audience with the officials and staff of Caritas Internationalis – the global federation of Catholic charitable and humanitarian efforts – on whose board the new archbishop serves by Vatican appointment. A much fuller piece to come... for now, in 2010 these pages indicated Hebda as one of four recently-named Stateside prelates likely to impact the future on the wider scene. Three years to the week, he's not only become the second-youngest US archbishop, but among the heads of the nation's ten largest local churches, he's now the youngest by more than eight years. Bernard Hebda, 51, bishop of Gaylord: The paper-trail is unusually distinguished, even for an American bishop -- Harvard BA, JD from Columbia Law, JCL from the Gregorian, for 13 years a top-flight Vatican canonist as the #3 official at the Pontifical Council for the Interpretation of Legislative Texts. Ask the folks back in Pittsburgh, though, and you’re more likely to hear stories of Bernie Hebda doing the “Electric Slide” at parish festivals on return trips to his hometown. The trend’s been wise -- if you’re rebuilding a bench, Steeler Country’s a great place to start; Eastern enough to boast a strong Catholic ethos, but Midwestern enough to be devoid of the ecclesiastical grandeur that’s only expedited the faith’s epic fall along much of the Amtrak/I-95 corridor. Moreover, Pennsylvania’s western edge prides itself on its down-home sensibility -- and like DiNardo before him, Hebda’s yearning to trade St Peter's for PNC Park became so well-known that, one night a couple years back, a friend in the Canadian hinterlands called with word that “Bernie wants out,” even if the "news" was never a pontifical secret. In the end, Hebda had to settle for half his wish -- as opposed to a return to the Burgh, his ticket out of the Vatican saw him dispatched to the northern reaches of Michigan, where the nuances of the canons are about as useful as shorts in December. But the move was no exile -- despite his path, like most of his fellow appointees under Benedict, Hebda’s blood runs more pastoral than administrative; fresh from the Greg, he spent three years on a pastoral team tasked with serving a new parish formed from the closure of seven churches, then was campus minister at a local college when the call to Curial service came. Seen far more widely as “brilliant, generous, gentle and pious” than through the lens of ambition -- the latter being, as never before, a particular file-killer in Benedict’s value-judgment -- even if he was heading to a place he’d never been before, simply returning to the trenches made for an especially happy homecoming. Still, the story is just seeing its start. When DiNardo was named the American South’s first-ever Roman prince three years ago, this scribe asked a friend what would happen to the simple “Council ring” the cardinal-designate received at his 1997 ordination as bishop of Sioux City -- the only bishop’s ring he would wear until the pope slipped the gold bas-relief of the Crucifixion (today’s version of the now-abolished sapphire band) on his finger. After seven happy years in northwestern Iowa’s 125,000 miles of cornfields, the cleric who'd become "Sixburgh’s" second Roman prince was transferred to Texas, and the rest is history. Hebda marks his first anniversary in Gaylord come December... so for the rest, see you in 2016, or sometime thereabout. And well, three years ahead of projection, here we are. 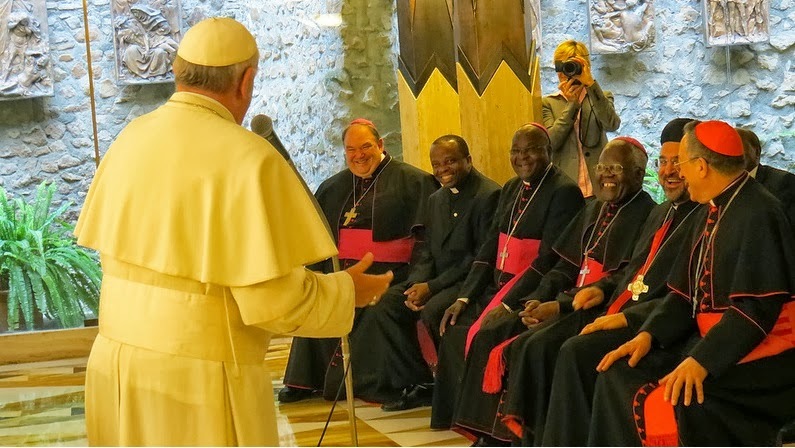 Pope At Angelus: "Who Are We to Judge?"